Die Landtage stellten einen zentralen Faktor des österreichischen Parlamentarismus dar, wählten sie doch bis 1873 die Abgeordneten zum Reichsrat aus ihrer Mitte. Obwohl sie 1873 diese wesentliche staatsrechtliche Kompetenz verloren, stieg ihre Bedeutung insgesamt an, da die Länder innerhalb des politischen Gesamtsystems immer stärker den Part der „bürgernahen Verwaltung” übernahmen. Die materialgesättigte Übersicht über die Leistungen der Landesvertretungen fördert ein beeindruckendes Maß an Aktivitäten zutage, die freilich des öfteren an die Grenzen des finanziell Machbaren stießen. Im Sinne des föderalistischen Gedankens wurde jeder Landtag auch gesondert behandelt, wodurch der Blick auf zahlreiche Spezifika der in vieler Hinsicht so unterschiedlich strukturierten Landtage Cisleithaniens fällt. Auch die Landtage von Siebenbürgen und von Kroatien, die sich verfassungsrechtlich in einer ganz anderen Position befanden, werden entsprechend gewürdigt. Ein weiterer Beitrag beschäftigt sich mit den Vertretungskörperschaften in den ungarischen Komitaten, denen innerhalb des ungarischen politischen Systems eine Rolle sui generis zukam. Die Gemeindevertretungen – obwohl nach einem einheitlichen Schema organisiert – wiesen in ihrem Erscheinungsbild und in ihrer Tätigkeit eine große Variationsbreite auf. Nichtsdestoweniger werden personelle und sachliche Verflechtungen zu den anderen Ebenen der Politik, zu Ländern und zum Staat, deutlich. Einen Sonderfall stellte der nach der Annexion von 1908 installierte bosnische Landtag dar. Er spielte bei der wirtschaftlichen und politischen Aufbauleistung der Provinz eine eher bescheidene Rolle; seine Aufgaben übernahm die längste Zeit die Staatsverwaltung. Überall sonst aber kamen den Landtagen im Modernisierungsprozeß und in dem der bürgerlichen politisch-ökonomischen Emanzipation der Völker des Habsburgerreiches stets wichtiger werdende Aufgaben zu. Diese herauszuarbeiten und entsprechend zu gewichten, stellt eines der großen Anliegen dieses Bandes dar. For simple material reasons, activities conducted by organized groups in the Habsburg Monarchy were restricted to a comparatively small audience. 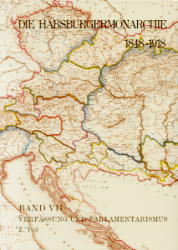 The press was responsible for the political mobilization of remote regions of the Habsburg Monarchy, areas in which social and cultural development varied greatly, and it created general political opinion that to some extent was felt in the entire Habsburg Monarchy. Together, associations, political parties and the press formed the civil society of the day. As can be expected from a language-based medium, the press of the Habsburg Monarchy generally followed linguistic-national lines. In this volume, therefore, the 16 authors from 10 different countries (different than the contributors of Part 1, bringing the total number of authors to 44) deal primarily with "national" news media. In addition, studies that discuss publishing ordinances, newspapers with a wider influence, and the contribution of the press to modernization in the light of communication studies and media history are also included. The beginning of a regular press in the Habsburg Monarchy can be dated to the early 18th century, but in 1848 there was an explosive increase in the number of newspapers. After the revolution there was a rapid decline, followed by a period of stagnation. From the1860s, there was irregular regional growth, and after the turn of the century, the press became a journalistic mass market. Of the approximately 3,200 newspapers mentioned in this volume (also listed in an appendix), most existed for only a short period of time with a relatively small circulation. A circulation of less than 1,000 was not unusual, even for clearly political newspapers. Yet it would be misleading to judge the influence and the range of a newspaper only by the number of copies printed. In the many reading rooms, clubs and coffee houses, newspapers were read by more than one person, and public readings were common in areas of widespread illiteracy. After 1900 quite a number of papers had a daily circulation of 100,000 or more. These were clearly economic enterprises bent on making a profit. But even smaller enterprises did not disregard economic aspects (if they did, they were soon bankrupt), although their main interest lay in the propagation of political views (for which quite a number of journalists were prepared to sacrifice both personal matters and financial gain). In short they were interested in the creation of a " general political opinion". It is fair to say that on the complex path from constitutionalism to democracy, difficult for any multinational state, the Habsburg Monarchy certainly did not lead the European states, but it also did not bring up the rear. Its course of "conservative modernization" slowed the otherwise rapid development of public opinion, but it did not prevent the spread of political mobilization to remote parts of the crown lands. It thus laid the basis for the tradition of a civil society, which, despite the dramatic upheavals of the last century, can still be felt today.